FIRE AT TELOK BLANGAH HAWKER CENTRE! You are at:Home»Caught In The Act»FIRE AT TELOK BLANGAH HAWKER CENTRE! 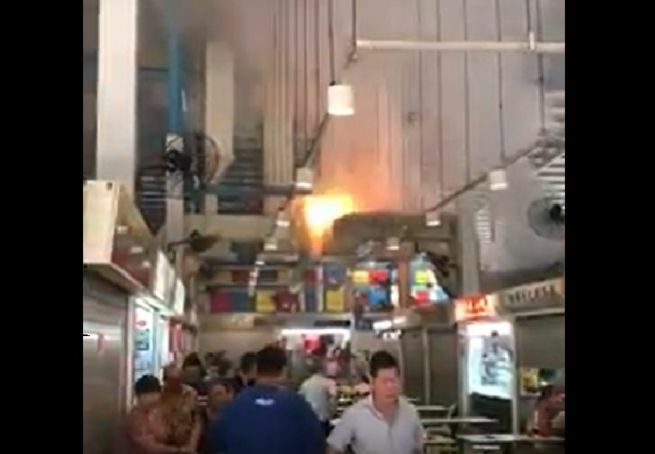 The fire can be seen burning on the vents of the hawker centre. The incident took place at Blk 11, Telok Blangah Cresent. The fire was swift and after a few seconds, the smoke started to engulf the area. Patrons of the hawker centre can be seen panicking and quickly move to a safer area. The SCDF was just as quick to respond to the fire as well, moving from the source of the fire (a fishcake stall) to where the fire moved. Good work from our boys in blue. Previous Article3 ERPs WILL NOT CHARGE DURING MORNING PEAK HOURS!